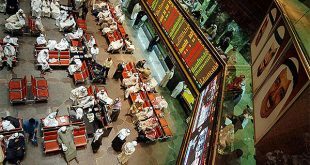 KUWAIT CITY, Aug 6: Kuwait stocks pulled higher on Monday as it continued its winning streak to fourth consecutive session. The All Shares Index climbed 16.78 points in choppy trade to 5,259.05 pts led by banks and some of the other blue chips. The Premier Market jumped 27.51 pts to 5,437.56 points while Main Market fell 2.8 pts to 4,934.87 points. The volume turnover meanwhile rose further following last session’s surge. Over 131 million shares changed hands — a 13.4 pct rise from the day before. The sectors closed mostly in positive turf. Oil and gas outpaced the rest with 2.98 pct gain whereas telecommunications shed 0.48 pct, the biggest loser of the day. Volume wise, banks notched the highest market share of 38 pct and financial services followed with 31 percent contribution. In the individual shares, National Bank of Kuwait rallied 8 fils to 828 fils on back of 4.5 million shares while Kuwait Finance House climbed 6 fils with brisk trading and is up 23 fils so far during the month. Independent Petroleum Group jumped 27 fils to 448 fils. Zain slipped 4 fils to 493 fils after trading over 4 million shares while Ooredoo added 6 fils to close a 800 fils. Kuwait Telecommunications Co (VIVA) was flat at 730 fils off early lows and Agility jumped 20 fils extending last sessions gains. The market opened firm and headed higher in early trade. The main index scaled the day’s highest mark of 5,265 points amid spurt in buying in select counters and pulled lower. It drifted range bound thereafter amid mixed sentiment and closed with modest gains. Top gainer of the day, Kuwait Livestock Transport Co spiked 9.6 pct to 205 fils and Sanam Real Estate Co scaled 9.46 pct to stand next. First Insurance Co shed 10 percent, the steepest decliner of the day and Gulf Bank topped the volume with over 15 million shares. Mirroring the day’s gains, the winners outnumbered the losers. 57 stocks advanced whereas 50 closed lower. Of the 131 counters active on Monday, 24 closed flat. 6,023 deals worth KD 30.7 million were transacted. down 1.2 pct in value from the day before. National Industries Group rose 3 fils to 167 fils with heavy trading while Mezzan Holding stood pat at 720 fils. Boubyan Petrochemical Co gained 10 fils and Al Qurain Petrochemical Co was up 3 fils at 338 fils. 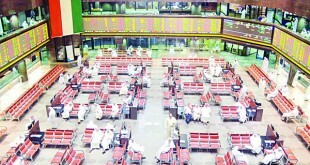 Gulf Cable was unchanged at 385 fils. Jazeera Airways fell 5 fils to 750 fils and ALAFCO gave up 4 fils before settling at 351 fils. Heavy Engineering Industries and Shipbuilding Co extended last session’s gains with 16 fils jump to 457 fils. Equipment Holding Co tripped 1.1 fils. Kuwait Foundry Co and Kuwait Portland Cement were unchanged at 204 fils and KD 1.120 while NICBM and KPPC took in 1 fil each to close at 175 fils and 61 fils respectively. Educational Holding Co dropped 10 fils and Automated Systems Co followed suit to wind up at 125 fils. Humansoft Holding fell 5 fils to KD 3.445 after posting hefty losses in the da before and NAPESCO gave up 4 fils. Mashaer Holding Co clipped 2.8 fils and Al Rai Media Group ticked 0.1 fil into green. Inovest inched 1 fil into red. OSOS climbed 7.7 fils to 98.9 fils. Kuwait and Gulf Link Tranport Co rose 3 fils to 113 fils and KGL Logistics edged 0.4 fil up to 46.1 fils. Burgan Well Drilling Co gained 6.9 fils and Combined Group Contracting Co stood pat at 421 fils and KCPC too did not budge from its earlier close of 237 fils. In the banking sector, Gulf Bank dipped 8 fils with brisk trading whereas Kuwait International Bank ticked 1 fil into red. Burgan Bank added 3 fils on back of 2.3 million shares and Boubyan Bank dialed up 2 fils. Commercial Bank gained 5 fils whereas Al Ahli Bank was down 16 fils at 114 fils. Al Mutahed rose 4 fils to 303 fils while Warba Bank and Ahli United Bank paused at 238 fils and 211 fils respectively. 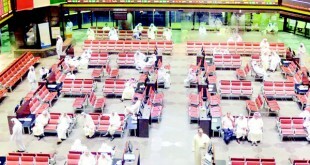 KIPCO and Gulf Finance House were flat at 232 fils and 105 fils respectively whereas Kuwait Investment Co added 3 fils. National Investment Co and Securities House Co paused at 92.5 fils and 51 fils respectively whereas Al Mal Investment tripped 0.4 fil. Unicap stalled at 57 fils. KAMCO eased 1 fil to 77 fils and KFIC gave up 1.7 fils to close at 47 fils. Coast Investment Co and Noor Financial Investment took in 0.1 fil each while Tamdeen Investment gained 20 fils. Kuwait Investment Co was up 3 fils at 132 fils. Bayan investment added 2.2 fils and Amwal nudged 0.5 fil into green. Al Imtiaz and Al Deera Holding paused at 131 fils and 18 fils respectively whereas Osoul Investment clipped 1.5 fils. Kuwait Insurance Co climbed 13 fils to 310 fils and Warba Insurance Co ticked 1 fil into red. Mabanee Co was flat at 680 fils and National Real Estate Co held ground at 118 fils. Mazaya Holding fell 0.3 fil ti 88 fils and Kuwait Real Estate tripped 0.2 fil. Salhiya Real Estate slipped 4 fils to 330 fils. The market has been upbeat so far during the week gaining 53 points in last two sessions and has rallied 92 points from start of the month. 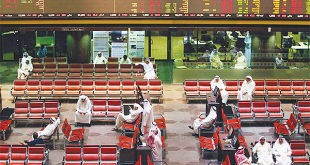 Boursa Kuwait, with 176 listed stocks, is the second largest market in the region.